To meet the odour control requirements of the catering & food processing industries the Katercarb activated carbon filter unit has been designed and developed by EMCEL Filters Limited to meet heavy duty application requirements. Carbon Filter Cells with a special grade of activated carbon to deal more effectively with food and catering odours, especially those generated by onions, garlic and other strong spices. 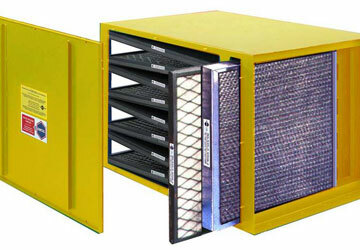 An integral non-combustible and washable grease filter to protect the carbon cells from grease saturation. A disposable particle pre-filter pad held within a metal grille and frame to protect carbon cells from dust contamination.